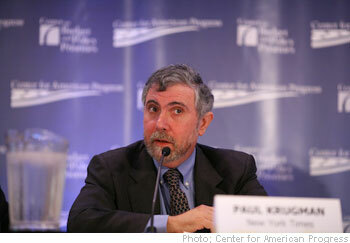 It’s always a good day when Paul Krugman throws a nice easy pitch over the fat part of the plate. In this post commenting on Beckworth he combines all of the worst features of his blog, in one nice package with a bow on top. where M is the money supply, V the velocity of money, P the price level, Y real GDP. And of course this always holds true, by definition. But the temptation is to take it as a causal relationship — to say that real GDP fell because nominal GDP fell, and that this in turn was caused by either a fall in M or a fall in V; and furthermore that any such decline is a failure of monetary policy, because the central bank should have either prevented the fall in M or increased M enough to offset the fall in V.
The second sentence has to be one of the weirdest things I have ever read by a famous economist. I have no idea the point he is trying to make. It is essentially saying that underlying the statement that A*B is important is the implication that A*B = M*(A*B/M). Okay . . . The problem in this post is that Krugman confuses the view that falling nominal GDP is a problem, with various monetarist dogmas. He is essentially saying that if you mention that falling NGDP is the problem, you might be led to think of the MV=PY equation, and that if you even think about the (completely true) MV=PY equation, then you might start thinking about some sort of monetarist dogma that he thinks is false, and that he thinks he proved is false in a 1998 paper, even though the 1998 paper actually shows that the monetarists are completely correct in asserting that a once-and-for-all increase in M will cause PY to increase. Got that? In fact, almost everything Krugman has written on the crisis has implicitly assumed that falling NGDP is precisely the cause of our recession, and that stimulus aimed at boosting NGDP is the solution. How does he suddenly reach the conclusion that falling NGDP is not the problem? First he points out that in his 1998 model of liquidity traps the price level is fixed in the short run. Of course in the real world the price level is not even fixed in the short run, and responds to changes in AD. But let’s put aside that little objection, and see what the fixed price assumption implies. If the price level is fixed then movements in RGDP and NGDP are identical. Thus any policy that effectively prevents a fall in NGDP will also prevent a fall in RGDP. Of course Krugman has been arguing that fiscal stimulus can do this more effectively than monetary stimulus, but that’s a completely unrelated issue. Even if fiscal stimulus is the only solution, it would not in any way change the fact that falling NGDP is the cause of our crisis. A turnaround in NGDP is both a necessary and a sufficient condition for economic recovery in Krugman’s model, and falling NGDP is both a necessary and sufficient condition for any demand-side recession in his fixed-price Keynesian model. Even worse, when opponents of the NGDP view have attempted to come up with real explanations of the recession, he has ridiculed those views. These alternative theories include Kling’s “recalculation hypothesis” which suggests that a recovery in RGDP requires time-consuming and costly restructuring, downsizing, retraining, etc. If Kling is right then the current recession is not just a shortfall in nominal spending (as Krugman implicitly assumes in his analysis) but rather represents a real problem. Kling’s argument and some related Austrian and RBC explanations suggest that higher NGDP might lead to higher inflation rather than more real output. So if Krugman is contemptuous of all those right-wing “real” explanations of why fiscal stimulus won’t work, how in the world can he claim NGDP is not the problem? Of course it’s the problem. Sometimes it seems like waving MV=PY in front of a Keynesian is like waving a red flag in front of a bull. It so enrages them that they lose sight of economic logic. Keynes’s entire General Theory is basically a theory of PY, and hence necessarily a theory of MV. (In fact V doesn’t have any independent meaning; it’s just PY/M.) Sure Keynes often assumes fixed prices in the GT, but not always. And what happens when he relaxes the fixed price assumption, which variable does he see AD affecting, RGDP or NGDP? The answer is obvious. Keynes relaxes the assumption at full employment, or what he calls “bottlenecks” in the economy. If the economy has reached capacity then any further increases in AD continue to cause increases in NGDP, but RGDP no longer rises. So the General Theory is first and foremost a theory of nominal income determination. The impact of AD on RGDP is entirely contingent on the slope of the SRAS curve. For the millionth time, the equation MV=PY has zero monetarist implications, and that’s doubly true for the concept of nominal GDP. Now let’s look at the more important part of Krugman’s post, his argument that money can’t save us now, and that this result was proved in his 1998 paper, which he increasingly describes as a sort of a road to Damascus moment in his intellectual career. There is just one little problem with this story, the article he cites makes the opposite argument from what he keeps claiming in these posts that link to it. It claims monetary policy can be effective in a liquidity trap, and that an appropriate monetary strategy seems a more promising option than fiscal stimulus. First let’s see what he says in the article, and then figure out what’s really going on. While this policy could work, however, is it the right one for Japan? Japan has already engaged in extensive public works spending in an unsuccessful attempt to stimulate its economy. Much of this spending has been notoriously unproductive: bridges more or less to nowhere, airports few people use, etc.. True, since the economy is demand- rather than supply-constrained even wasteful spending is better than none. But there is a government fiscal constraint, even if Japan has probably been too ready to use it as an excuse. And anyway, is it really true that it is impossible to use the economy’s resources to produce things people actually want? Monetary policy: It may seem strange to return to monetary policy as an option. After all, haven’t we just seen that it is ineffective? But it is important to realize that the monetary thought experiments we have performed have a special characteristic: they all involve only temporary changes in the money supply. This point needs enlarging upon. Because the traditional IS-LM framework is a static one, it cannot make any distinction between temporary and permanent policy changes. And partly as a result, it seems to indicate that a liquidity trap is something that can last indefinitely. But the framework here, rudimentary as it is, suggests a quite different view. In the flexible-price version of the model, even when money and bonds turn out to be perfect substitutes in period 1, money is still neutral – that is, an equiproportional increase in the money supply in all periods will still raise prices in the same proportion. So what would a permanent increase in the money supply do in the case where prices are predetermined in period 1? Even if the economy is in a liquidity trap in the sense that the nominal interest rate is stuck at zero, the monetary expansion would raise the expected future price level P*, and hence reduce the real interest rate. A permanent as opposed to temporary monetary expansion would, in other words, be effective – because it would cause expectations of inflation. This sounds funny as well as perverse. Bear in mind, however, that the basic premise – that even a zero nominal interest rate is not enough to produce sufficient aggregate demand – is not hypothetical: it is a simple fact about Japan right now. Unless one can make a convincing case that structural reform or fiscal expansion will provide the necessary demand, the only way to expand the economy is to reduce the real interest rate; and the only way to do that is to create expectations of inflation. By the way, it is odd to describe this policy as “ineffective.” The BOJ said it wanted a stable CPI and for the most part got one. The term ‘misguided’ would be much better than ‘ineffective’ as the latter term suggests (wrongly) that Japanese policy failed achieve its objectives. It succeeded in achieving its objectives; the problem was that it had the wrong objectives. In that model, prices are assumed sticky in the short run, so P is predetermined. What, then, determines Y? Well, it’s a real thing — as opposed to a nominal thing. In the model it’s actually tied down by an Euler condition, by future consumption and the real interest rate (which is stuck thanks to the zero lower bound). Monetary policy has no traction at all against the right hand side of the equation. Now, the equation still holds. But all that tells us is that any changes in the money supply are offset one for one by changes in velocity. Focusing on nominal spending makes you think that low nominal spending is the problem, a problem with a monetary solution; but actually it’s the symptom, and monetary policy doesn’t matter (unless it can affect expected future inflation, but that’s another story). I suppose Krugman defenders will again point to the final parenthetical remarks. But how many of his readers would even notice that, or understand what it means? How many people realize that in a rational expectations model that has an upward sloping SRAS curve all monetary stimulus, liquidity trap or no liquidity trap is only effective if it can influence the future expected inflation rate. As a practical matter if monetary injections have no impact on the expected future inflation rate then they won’t impact current AD. So all he is really saying is that monetary policy is ineffective, unless it is effective. I can’t argue with that! Now let’s review Krugman’s criticism of Levitt and Dubner’s chapter on global warming. Recall that their chapter opened with a charming and entirely accurate anecdote about how “some” scientists had predicted global cooling in the 1970s. But then Levitt and Dubner went on to emphasize that the current science on global warming was quite solid, and therefore we needed to consider some pretty extreme policy options for dealing with this very serious problem. Krugman argued that their opening 1 1/2 pages of this 45 page chapter were misleading, leaving the clear impression that the current consensus for global warming was suspect. I don’t see how anyone reading the entire chapter could conclude that, but let’s say Krugman was right. Even Levitt and Dubner’s worst enemies would have to concede that they also presented lots of evidence in favor of the global warming hypothesis. There is essentially a consensus among climate scientists that the earth’s temperature has been rising and, increasingly, agreement that human activity has played an important role. And then they spent 20 pages discussing promising options for dealing with the problem. Even worse, Krugman did this when discussing one of the most important issues facing the world today. The unemployment rate hit 10.2% today because of a lack of NGDP. Monetary stimulus plans discussed in Krugman’s 1998 paper offer a very promising way of addressing that nominal shortfall (although NGDP targeting would be even better than inflation targeting.) And Krugman gave the average reader little reason to be hopeful about monetary stimulus. Levitt now says that the chapter wasn’t meant to lend credibility to global warming denial — but when you open your chapter by giving major play to the false claim that scientists used to predict global cooling, you have in effect taken the denier side. . . . And that’s not acceptable. This is a serious issue. We’re not talking about the ethics of sumo wrestling here; we’re talking, quite possibly, about the fate of civilization. It’s not a place to play snarky, contrarian games. That’s how I feel about Krugman. He creates the impression that monetary stimulus can’t work, even though his scientific writings suggest otherwise. And a recession causing tens of millions of workers around the world to become unemployed, perhaps for many years, is also a very serious issue. PS. Check out Beckworth’s excellent post and see how many times he mentions the hated MV=PY equation, the equation that one can’t help thinking about anytime one mentions nominal GDP. PPS. I am assuming someone else (like Kling) will handle Krugman’s proposal for a new WPA and CCC. How would this work in the 21st century? Someone with a better imagination than me can run with this one. We need monetary stimulus, and we need it soon.